Meriwether Lewis was an American explorer, soldier, and public administrator. He is best known for the Lewis and Clark Expedition which he co-led with his friend William Clark. 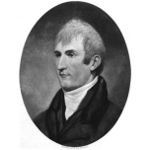 Meriwether Lewis was born in 1774 to a Virginia Planter family. His father William Lewis was an officer during the American Revolution. Just three years after his famous expedition out west, Meriwether Lewis died in 1809 while traveling through Tennessee on his way to the nation's capital. It is still debated today as to whether he committed suicide or was murdered. Meriwether has a large number of famous kin, but what is most interesting is how closely related he is to some of them. President George Washington is a second cousin one time removed while President James Madison is a third cousin. He is a second cousin four times removed to General George S. Patton and a fourth cousin one time removed to General Robert E. Lee. He is also has some fairly close kinship to the current royal family being a third cousin six times removed to Queen Elizabeth II.